I'm downsizing from my 55 gallon tank now that all of my fish have passed on after several years. Between 2 jobs, school, and the dogs, it's just too much to maintain. I have a 20 gallon tank that I'm going to set up this weekend hopefully. I think I'm going to do a pea puffer tank with live plants, or maybe stick with a community set up. Also toying with the idea of a betta and a school of cories. We'll see! Anyways, I was just curious to see what kind of fish you guys have, how long you've been keeping fish, etc! I'd love to get a betta in the near future! Haven't bit the bullet yet, though. I have a small pond of goldfish at my parents' house. My parents originally bought three feeder goldfish to have in one of their cow tanks to keep algae down - they ended up giving birth. I took a few when they were young and moved them up to the small pond we have by the house and they're growing and thriving. They even had a few babies of their own. It's so much fun to just sit and watch them, plus they're pretty friendly! Late last summer my parents bought two Koi that were on sale at the local pet store to put in with them - honestly, since the Koi are orange/black/white (like the goldfish) you can't really tell them apart. I have a male veil tail (say that 3x fast ) betta. His name is Sharky Quesadilla and he is such a great fit! I got him from Petco and assessed a few fish before choosing him.My other betta, Captain Murphy, was a craigslist rescue from someone who was moving. He was a little sickly when I got him, and already 2+ years old, so unfortunately I did not have him very long before he passed. Sharky is just like my dogs. He's super interested in people, very food motivated (as all healthy fish are), fearless and curious. He explores every inch of the tank, tries to swim into the filter, and likes to wriggle through difficult passages just for the heck of it. When I sit in front of the tank, he is right there and unwavering. I've been very casually training him since day one and he religiously targets fingers, and jumps up to target too. I'm currently working on him going through my hands (in the shape of a hoop). Like the dogs, he never eats for free. Even on my lazy days he needs to target before getting food. My setup is a 10 gallon tank with heater and filter, silk plants, gravel substrate. Pretty basic. I have two snails doing some light house keeping too. I love bettas so much! I had a girl who I trained to target a small rod with a red ball on the end of it. I could put it in the tank and she would chase it around. I'm sure she didn't really need to be 'exercised' but I had fun doing it haha. Your guy sounds like quite the character. I haven't had much luck teaching my other bettas anything, but then again I haven't tried very hard. I used to have a 55 gallon long time ago. My last adventure was salt water, beautiful fish but a lot of work. Now I just have the one acre pond. I consider those fish pets. Stripped and large mouth bass, blue gill, black crappie, two very large white amur or you could call them grass carp; they are three feet long, over 20 years old, they are cool they come over to the dock to be fed. Had a really cool cat fish about 2 feet long, he came over and ate out of your hand but last year he passed on, he was 12 years old. Also have two painted turtles and two snapping turtles. Everyone it's hibernating now under the ice!! I LOVE Corries! I've had Peppered, Julii, Panda, and Sterba in the past. Right now I just have one lonely Julii cat left in my baby guppy tank since his tank mates recently passed a couple months ago. I really love how generally hardy and tolerant they are, my Corries had easily survived a number of tank changes and remodels. My Peppered Cory also successfully reproduced without any effort on my part, I started with a trio from Petsmart and ended up with 19 by the end of the year. I really want to do a custom Cory cat tank in the future and try out more varieties; I just don't have the time or space ATM. The only thing that I didn't like about them when I started out is that they shift the substrate, so you have to be aware of that when you set up your hardscape, hence the need for multiple remodels. I've gotten much more intuitive to their habits now and can plan out an appropriate tank layout that doesn't shift or fall over and encourages their natural behavior. If you are going to do a planted tank, but also want less maintenance be sure to do your research on which plants you choose. There's quite a few plants out their that grow rapidly and need constant trimming if you don't want them to overtake the tank in a week. Moss is often picked because they are slow growers and stay small, but I've found that you usually end up eventually battling algae at some point when you have moss in the tank. 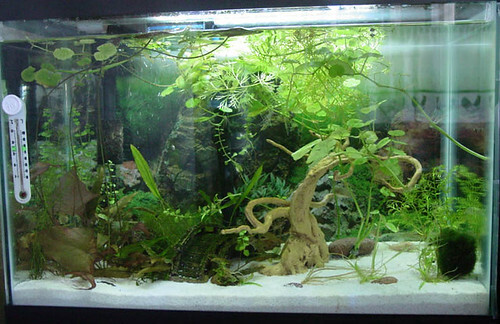 Personally I think the best choice for a planted tank is anubais, they're slow growers and maintain their size; you just have to make sure to secure them well or your fish may knock them out of their spot and you'll come home to a bunch of plants floating around in the tank. Everybody's got a laughin' place; trouble is most folks won't take the time to go find it. I've got 3 tanks, all planted - a 10 gal. 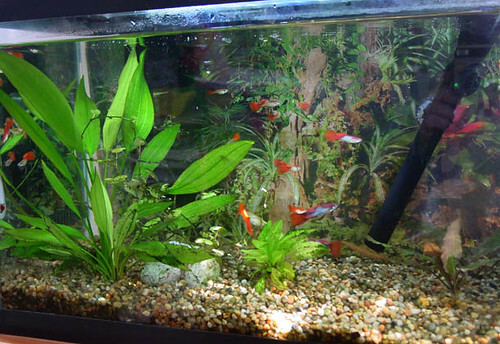 with guppies, a 20 gal. with cories & a betta, & a 75 gal. with a couple of goldfish. Shahbazin, I really like your tanks. I have my own for 20 gals but he isn't so beautifully (( On the other hand, he endured three moves (I rent an apartment) Now I have the most simple fish: mollies, guppy, panda corydoras. I would like in the future to have a separate aquarium for ancistrus(orange bristlenose catfish).